Like many dog lovers, I’ve been passionate about these special little creatures all my life. With pure hearts and minds and the desire to simply be happy and share in our love and fun, I think there is so much we can learn from our four-legged friends. My admiration for the unconditional love our fuzzy little ones show has been the driving force behind my desire to give back to them as much as possible. I am not a canine expert by any means, nor do I possess any formal qualifications in the field, but what I do have is a genuine passion and desire to learn more as I grow and share my life with these wonderful creatures. I truly believe we are all constantly learning not only about our dogs, but about ourselves too. The understanding of our own health and nutrition is constantly evolving as we learn and discover more, as is the health and nutrition needs for our little buddies. There was a time when we believed a tin of cheap dog food was an efficient food source for our dogs, but of course we now know that whilst a basic diet such as this might appear sufficient at first glance, it has the possibility to contribute to many illnesses or health deficiencies later in life. Nowadays we are all so much more aware of the importance of nutrition, and the major role it plays in the future health of both ourselves and our dogs. Unfortunately, preservatives and cheap meat by-products still play a major role in the commercial pet food market. For this reason, I have chosen to feed my dogs human-grade foods for some time in conjunction with high quality commercial foods. Fortunately, I am in a position to be able to cook for them as well which enables me to know exactly what goes into their food and am able to have a bit of fun providing them with great variety in their diet as well. Many people are still of the belief that dogs are purely carnivorous, but in fact dogs are omnivores just like humans. They do require more protein in their diet than we do, but this protein can be obtained from legumes and other vegetarian sources. I am certainly not suggesting the diet for a dog should be purely vegetarian, but I am highlighting the fact they are designed to eat both meat and vegetable matter. Dogs are natural scavengers and will feed on what is available to them at the time, including fruit and vegetable matter. A combination of these foods is an ideal way to meet their nutritional needs. By providing your dog with a diet that combines both meat and vegetable sources, it not only affords great nutrients, but gives the variety which keeps your dog interested and happy. The majority of treats on the market are full of preservatives and sodium, mainly to make them taste good, but are they necessarily good for our dogs? We often choose to snack on healthy products for ourselves, why not provide our little friends with a healthy treat? It was thoughts such as these which prompted me to begin baking my own dog treats. Over time, these treats have changed and evolved as I continue to discover more and more about nutrition. Many dogs have allergies or experience side effects with wheat, and some even have allergies to meat! I was at a dog social function where the dogs were all being fed the classic meat-based treats, except for this one little girl who had some major skin problems, one caused by reactions to meat. She of course could not be given any treats like the other dogs around her. I handed the owner some of my meat-free treats and seeing the smile on her face and the delight of the dog receiving a tasty treat was quite heart warming. 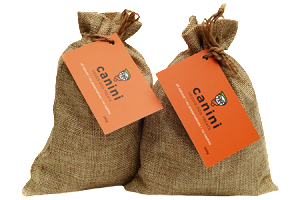 I have worked hard in preparing a healthy treat that your dog will love and use only the finest ingredients to ensure no preservatives or nasties are in Canini. I use organic ingredients where required and even the applesauce is prepared at home to ensure only quality ingredients go in. Canini Veggie Dog Treats are a great healthy non-meat alternative for all of our four legged friends, but can also complement a vegetarian diet. Canini Veggie Dog Treats may also be of benefit for those dogs with allergies, but please always check with your veterinarian before providing any new food source to your dog if they suffer from illnesses or allergies. I hope you and your best friend enjoy these dog treats as much as we do. Please feel free to provide any feedback you have. We’d love to hear from you- contact us here.